GM: Time for "strategic initiatives"
In the news today: GM chairman and CEO Rick Wagoner used the stockholders' meeting to outline the plans in store for GM. It looks like gas prices have finally gotten through. There's going to be more emphasis on smaller vehicles, an all-new Aveo, a new global compact Chevrolet, and funding to get the Volt on the road. There will also be plant closures, including one at the truck plant here in Oshawa, Ontario, where I live, which should go over really well. I've never figured out why the plants that win the most awards for quality always seem to be the first to close. And there's going to be a "strategic review" of the Hummer brand. Gee, ya think? The only surprise is that it took them this long. When you walk around a new-car show, it's the big stuff that draws your attention: flashy paint, big wheels, all-new models. But sometimes, the tiniest thing there could be the next wave of the future. 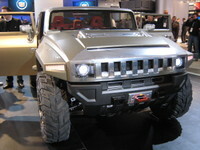 Case in point: this is the Hummer HX concept, which I saw at the Detroit Auto Show in January. It's a throwback to the Volkswagen Thing, with removable doors, roof and fender flares, and it's the work of three designers young enough to get carded when they go for a beer. It might be the basis of an open-air, entry-level model to compete with the Jeep Wrangler, but that won't be its legacy. Instead, these designers might have changed the whole way we look at car stereos. In short, the HX doesn't have one. It's got a full speaker system, though, and a jack to accept your iPod or other music player, and it's absolutely bloody brilliant. The CD player is going the way of the eight-track; who wants to carry a stack of slippery jewel cases when you can tote thousands of songs on something the size of a pack of gum? A great many people, me included, use the stereo as little more than a means to connect a digital player to the speakers. Looking into my crystal ball, I see a world where this configuration will be the default, and a stereo -- with AM, FM, satellite, CD or whatever -- is an add-on option. Out of everything unveiled at Detroit in 2008, I'm betting that this is the one that counts.